Hi Elon! The Top Dutch Joint Solar Array has a total planned capacity of 1,750 MW. It delivers enough electricity to power the equivalent of 467,000 households. Let’s do business! The Top Dutch Joint Solar Array will be the largest solar power plant in the world. To build this plant, we are going to buy 5,000,000 solar panels: roughly a 1.5 billion-dollar deal. Are you in for business? Last year we launched our ‘Hi Tesla. 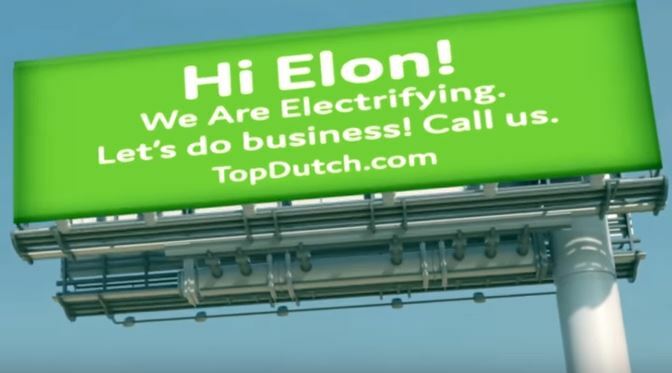 We are Top Dutch.’ campaign. We believe we have the best reasons for you to build the Gigafactory in our Top Dutch region. Last summer we already found thousands of potential employees for your Gigafactory. And now we are organizing business for Tesla. So Elon, let’s do business! Top Dutch is Europe’s energy transition region. Our energy companies power large parts of Europe. We believe in a green energy future. So, we are transitioning into renewable energy. For example, our Gemini offshore wind park is one of the largest in the world. We want to electrify everything and we are ambitious! We surveyed 400 companies in our region. At least 300 of them have the intention to electrify their car fleet. So, we are going to buy 20,000 electric cars with roughly a 1 billion-dollar value. And the potential for more is huge. Let’s bring the electric car back home.